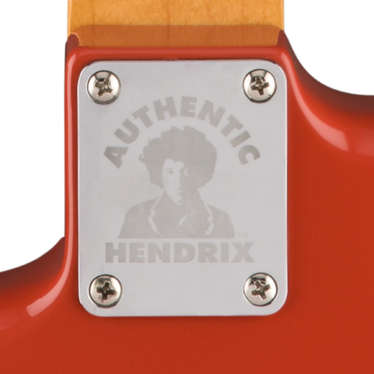 Musicians Mall launches Fender Mexican Artist Jimi Hendrix Ltd Edition Monterey Stratocaster with Artwork-0144953340,Double cutaway,Bolt-on,Pau Ferro,Vintage-style Fret size,21 Number of frets,Dot inlays,Configuration: SSS -Neck-Middle-Bridge Vintage-style single-coil Strat,passive pickups,Control layout Master volume,tone 1,tone 2, 5-way Pickup switch,Tremolo/Vibrato Bridge,6-saddle vintage-style syncronized tremolo Bridge design,Jimi Hendrix took the world by storm with his incredible Monterey Pop Festival performance, which he concluded with the sacrificial burning of his now-iconic hand-painted Stratocaster. Destroyed during the fiery culmination of his set, this one-of-a-kind guitar survived only in photos and film. To celebrate the 50th anniversary of this milestone in music history, we created the limited-edition Jimi Hendrix Monterey Stratocaster. 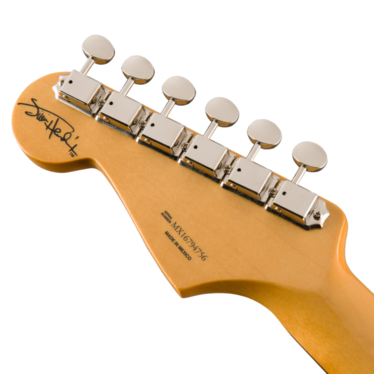 This instrument features single-coil Stratocaster pickups that evoke Fender’s classic ‘60s tones. It’s amazing that a guitar that was played only once would go on to be one of the most recognized in history, but that’s exactly the case with a one-of-a-kind Stratocaster that Jimi Hendrix sacrificed at the 1967 Monterey Pop Festival. 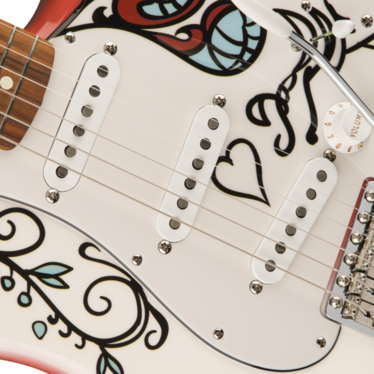 Hendrix hand-painted a flowery design on this legendary Strat—in nail polish, no less—the night before he was to close out the inaugural event and brought it out for his final song, “Wild Thing”.